CAMPBELL, CA--(Marketwired - April 21, 2015) - Technology market research firm Infonetics Research, now part of IHS Inc. (NYSE: IHS), today reported that the mobile infrastructure market in Japan fell 19 percent year-over-year in 2014, to $4.1 billion, as 3G investments in the region stalled. Based on Infonetics' worldwide Mobile Infrastructure Equipment report, this latest edition Mobile Infrastructure and Subscribers in Japan market share, size and forecasts report focuses specifically on the 3G and LTE infrastructure markets and subscribers in Japan. "As we forecast, the Japanese mobile infrastructure dropped by double digits in 2014 as a severe cut in 3G investments drove a decline that LTE could not offset despite the addition of over 100,000 eNodeBs," said Stéphane Téral, research director for mobile infrastructure and carrier economics at Infonetics Research, now part of IHS. "All three Japanese mobile operators, KDDI, NTT DOCOMO and SoftBank Mobile, have passed critical LTE mass deployments and will be tactically adding new macro eNodeBs while gearing up for 3.5GHz small cell deployments for capacity upgrades in 2016," Téral said. The Japanese government, which requires operators to continually invest in mobile infrastructure, freshly freed up the 3.5GHz band, which will shift the action from FDD to TDD LTE. Among Japan's mobile operators, only KDDI and NTT DOCOMO increased LTE spending in 2014; Softbank Mobile slashed its total mobile spend by a quarter. Nokia Networks is king of the Japanese radio market, owing largely to its LTE prowess. Japan had 145,053,600 mobile subscribers in 2014, up 6 percent over 2013. 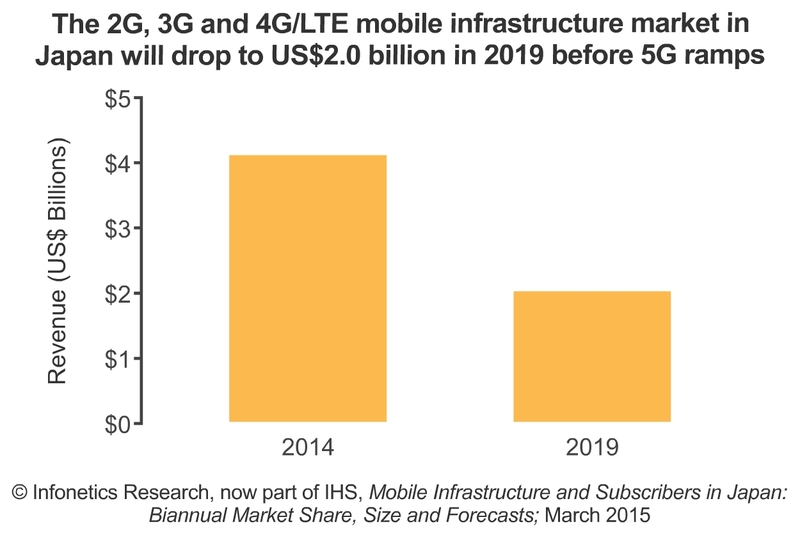 Infonetics/IHS expects the 2G, 3G and 4G/LTE mobile infrastructure market in Japan to fall to $2 billion in 2019, a 2014-2019 CAGR of -13 percent, before 5G ramps up. Infonetics' biannual Japan mobile equipment report provides market size, vendor market share, forecasts through 2019, analysis and trends for 3G (W-CDMA, CDMA2000) and 4G LTE (E-UTRAN, EPC) mobile network equipment and subscribers in Japan. The report also includes an LTE deployment tracker. Vendors tracked: Ericsson, Fujitsu, Hitachi, Huawei, NEC, Nokia Networks, Panasonic, Samsung, ZTE and others. To purchase the report, contact Infonetics: www.infonetics.com/contact.asp. Join analyst Stéphane Téral May 7 at 11:00 AM ET for The Path to VoLTE, an event exploring the architectural challenges of voice over LTE and how to overcome them using real-world use cases. Join live or watch on-demand at http://w.on24.com/r.htm?e=975258&s=1&k=7AC297AEFFA3005C5D20DF360C468B35. Download Infonetics' 2015 service brochure (http://www.infonetics.com/downloads/2015-Infonetics-Research-Services-Brochure.pdf) or log in: www.infonetics.com/login. IHS (NYSE: IHS) is the leading source of insight, analytics and expertise in critical areas that shape today's business landscape. Businesses and governments in more than 150 countries around the globe rely on the comprehensive content, expert independent analysis and flexible delivery methods of IHS to make high-impact decisions and develop strategies with speed and confidence. IHS has been in business since 1959 and became a publicly traded company on the New York Stock Exchange in 2005. Headquartered in Englewood, Colorado, USA, IHS is committed to sustainable, profitable growth and employs about 8,800 people in 32 countries around the world. Infonetics Research, now part of IHS (NYSE: IHS), is an international market research and consulting firm serving the communications industry since 1990. A leader in defining and tracking emerging and established technologies in all world regions, Infonetics helps clients plan, strategize and compete more effectively. Follow Infonetics on Twitter for the latest headlines: http://twitter.com/infonetics. "As we forecast, the Japanese mobile infrastructure dropped by double digits in 2014 as a severe cut in 3G investments drove a decline that LTE could not offset despite the addition of over 100,000 eNodeBs," said Stephane Teral, principal analyst for mobile infrastructure and carrier economics at Infonetics Research, now part of IHS.